Manchester United's new 16 million pounds signing Marcos Rojo's lingerie model wife has sent him to anger management sessions so that the defender does not see the red mist at Old Trafford. Hothead defender Marcos was sent off four times and shown 20 yellow cards in the past two seasons playing for top Portuguese side Sporting Lisbon, but the Argentine's missus Eugenia Lusardo warned him that unless he cleaned up his act there would be very few clubs in the world prepared to take on his tantrums. Two months ago Rojo agreed with Lusardo and underwent a course of temper therapy to calm him down, which was almost immediately followed by his dream move to United coming true, The Daily Star reported. The heavily tattooed player from La Plata has had England in his veins for years and has the words 'Pride' and 'Glory' inked on his legs. 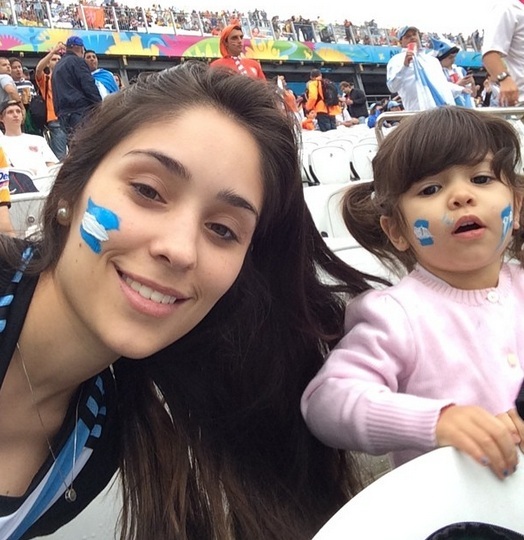 Lusardo, who models for Lisbon-based lingerie firm Dama de Copas, has a two-year-old daughter Morena with her husband. A United source said that when the club signed Rojo there was real excitement because of his reputation as being as tough as nails, and added that they thought it would be like getting another Roy Keane or Steve Bruce. The source said that they have heard that Rojo is a pussycat away from the game, and added that it seems the adrenalin on match day just gets him flying. 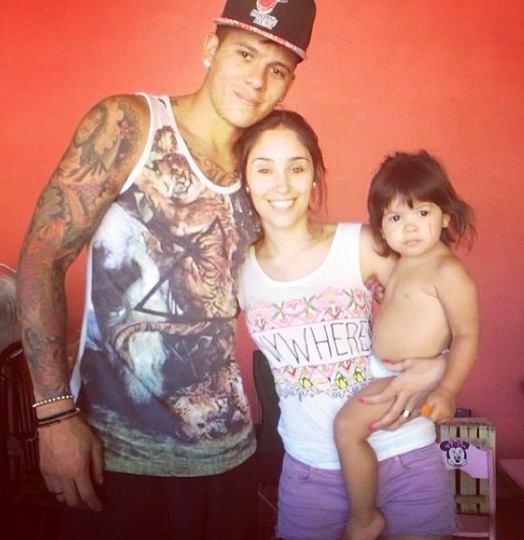 The source also said that Rojo has obviously got a good wife who cares about him. Andy Murray and his girlfriend Kim Sears were recently spotted cosying up to one another at a basketball game in New York. The 27-year-old Tennis pro was clicked placing his arm around Sears, who returned the PDA by interlocking her fingers with the tennis star, the Daily Express reported. Murray, who won the 2013 Wimbledon, sported a light blue Adidas hoodie with matching trainers and black tracksuit bottoms. The duo watched USA compete against Puerto Rico at their exhibition basketball game in Madison Square Gardens in New York City. Caroline Wozniacki recently admitted that she's "happy being single" post split from fiance Rory McIlroy. The 24-year-old tennis star player told her pal and fellow player Serena Williams, that she could "never hate" the golf ace, 25, who had called-it-quits after their wedding invitations had been printed, the Daily Star reported. However, Wozniacki, who's prepping up for the US Open, added that she didn't like the way they parted and knows what she's looking for in a relationship now. She continued saying that she didn't want her name to be attached to McIlroy forever as she was her "own person with her own career." Ever since the break-up, while McIlroy has won both The Open and the US PGA Championship, making it to top spot, Wozniacki is yet to win a Grand Slam. Las Vegas-born model and actress Jasmine Waltz has said that her boyfriend Danny Cipriani is a different man now. The former contestant of Celebrity Big Brother told the Sun that Cipriani was entirely a different man to the one she met four years ago and he put a lot of girls though a lot of s*** but hopefully he could now turn it around. The 32-year-old American actress continued she hoped that this was a new chapter for 26-year-old Cipriani and he was more of a man and was now a perfect gentleman. Waltz met her boyfriend four years ago in the States. Boxer Amir Khan has reportedly been sending X-rated messages to a lap dancer eight days after being blessed with a newborn baby daughter Lamysa. The former light welterweight world champion connected with the 26-year-old lap dancer, who has claimed that they have met five times in a Bolton car park and he has been bombarding her with X-rated messages within days of the birth of his daughter, the Mirror reported. Cheryl Cole has revealed that she and Louis Walsh still don't like each other. The 31-year-old 'X Factor' judge, who was earlier married to footballer Ashley Cole, said that she and Walsh 'agree to disagree' and would work together without love lost, the Mirror reported. According to the 'Call My Name' singer, the fight between her and the 62-year-old fellow panelist was good for the show. Cole added that it would have been very boring if both of them thought in the same way. What is Maria Sharapova's secret recipe for success? Scholes 'scared' about United's future. Are you?